This volume provides a unique synthesis of the relevant literature from academic studies in the fields of political science, marketing, advertising, speech communication, telecommunication, and public relations combined with the practical wisdom of professional consultants. Offering the reader both the theory and practical applications associated with negative political advertising, this is the first book devoted exclusively to the various forms of negative campaigning in the United States. After developing a typology of negative political spots for greater clarity in explaining and evaluating them, the book addresses effectiveness questions such as: What works? When? Why? and How? Contents: Part I:Introduction. Negative Political Advertising: History, Research, and Analysis. Part II:Analysis of Negative Political Advertising. Substance: The What in Negative Political Advertising. Negative Political Advertising Thematic Designs. Style: The How of Negative Political Advertising. Negative Ads: Sponsor and Channel. Part III:Negative Political Advertising and Society. Combating Negative Ads. Law and Ethics. Effects on Society: An Unexplored Area. "It provides many potentially useful categories that can be helpful to people planning political communication research studies and numerous issues to consider in designing political campaigns that will employ or have to respond to negative appeals." "The work is comprehensive in scope, grounded in an appreciation for the tradition of negative campaigning in US political history, cognizant of theoretical issues, thoroughly researched, well documented, and replete with examples." 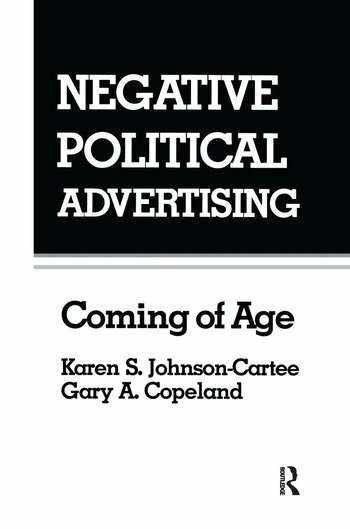 "...right on target in its assessment of the importance of negative advertising, and the extensive literature review alone will make it a worthwhile resource for those interested in political advertising." "...the most informative, most useful, and perhaps even the best available investigation of negative political advertising."